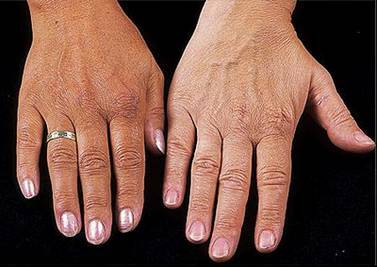 Hemochromatosis is a condition that is characterized by excess iron levels within the body. This condition can be hereditary (autosomal recessive condition often caused by mutations on the HFE gene) or can be acquired due to factors such as chronic transfusions (such as in patients with α-thalassemia or β-thalassemia). Hereditary mutations will often lead to the dysfunction of hepcidin within the body. 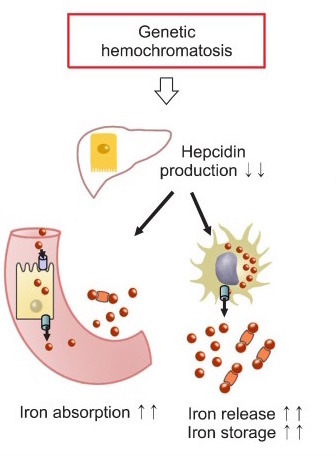 Given the role of hepcidin in stopping transport of iron from the cells of the intestine into the serum, this will result in constitutive absorption of iron from the gut. These high levels of iron will lead to iron deposition throughout tissues of the body (hemosiderosis). This iron will lead to free radical injury within the body which commonly leads to the classic triad of micronodular cirrhosis of the liver, diabetes mellitus, and skin pigmentation. The liver and pancreas are common sites of iron deposition, as is the heart (which can lead to cardiomyopathies). Skin hyperpigmentation (bronzing of skin) is often seen in this condition. Abnormal liver function tests might be observed on routine screening. Liver biopsy will reveal the accumulation of brown pigment in hepatocytes. 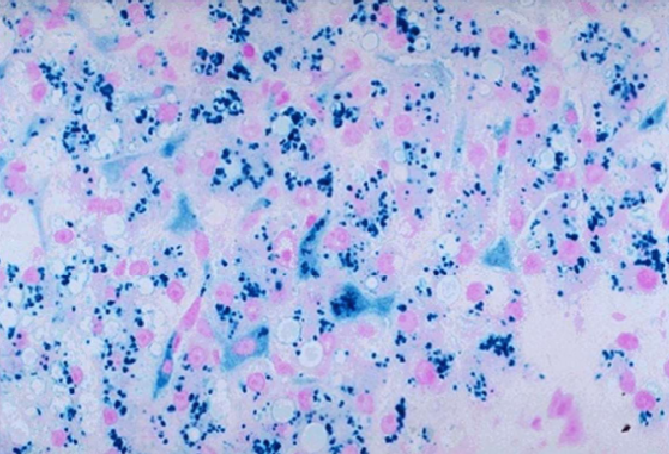 Using a Prussian blue stain iron can be distinguished in the biopsy (it stains blue) from the brown pigment of lipofuscin (normal byproduct of lipid metabolism found in liver). Genetic screening can ultimately be diagnostic for patients with hereditary hemochromatosis. For hereditary hemochromatosis, genetic screening can be very useful in ruling out other diagnosis. Phlebotomy: patients are routinely undergo regular phlebotomies in order to maintain serum levels of iron within normal levels. Menstruation: while not a “treatment” iron loss trough menstruation slows the progression of this condition in women. Hereditary hemochromatosis patients can be well controlled with routine phlebotomy. While hereditary factors can not be prevented, patients who require chronic transfusions (α-thalassemia/β-thalassemia) should have their iron levels monitored closely, and can be prescribed iron chelators to avoid the acquisition of hemochromatosis. Dilated or restrictive cardiomyopathy can be caused by hemochromatosis and can lead to hear failure. Hepatocellular carcinoma/hepatoma is associated with hemochromatosis. “Bronze diabetes” is a common buzzword for this exam (skin pigmentation + diabetes in the classic presentation. Common mutations include the C282Y (tyrosine for cysteine) or H63D on the HFE gene. Vitamin C Excess can increase the risk of iron toxicity in patients with hemochromatosis. Total body iron levels may reach 50g, which can be enough to set off metal detectors at airports.